Girl Scout Camp is a place to make new friends, try new things, and challenge yourself to grow while exploring nature and participating in camp activities. Girls get to experience a world away from home and unlock their endless potential. Our unique all-girl environment helps girls develop a positive self-image, as well as leadership and social skills they’ll use for the rest of their lives. Girl Scout Camp helps girls build courage, confidence, and character by connecting with others and their natural environment. 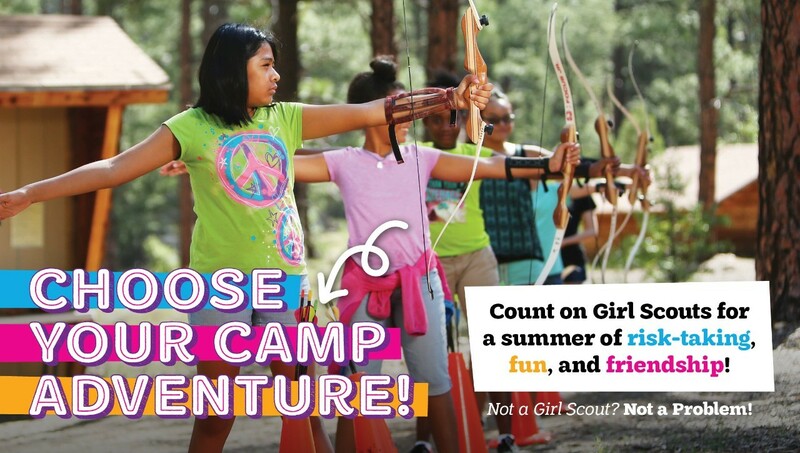 Download the 2019 Summer Camp Brochure and explore our four camps and all the awesome activities for girls to try! Make a list of which session(s) you would like to register for. Register online, it’s easy! Not a Girl Scout? Not a problem, all girls can register for camp!